Sting & Shaggy have announced a string of intimate and exclusive UK shows for May this year. 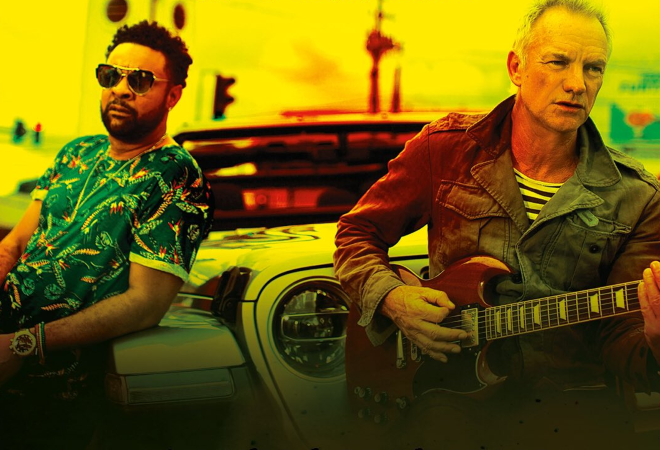 Sting and Shaggy will be joined on by Sting’s long time collaborators Dominic Miller and Rufus Miller on guitar and Josh Freese on drum, as well as Shaggy’s band members Melissa Musique and Gene Noble on backing vocals and Kevon Webster on keyboards. The pair took home the Grammy Award for Best Reggae Album at last night’s ceremony for their collaborative UK Top Ten hit record 44/876. They have already hit the road together in North and South America as well as Eastern Europe with their highly acclaimed tour featuring all the hits from their new album alongside solo classics such as ‘Every Breath You Take’, ‘Englishman In New York’, ‘Message In A Bottle’, ‘It Wasn’t Me’, ‘Mr. Boombastic’ and ‘Angel’. In spring last year Sting & Shaggy made UK headlines with their memorable performance of ‘Don’t Make Me Wait’ at Queen Elizabeth’s 92nd birthday celebration at London’s Royal Albert Hall. 2018 also saw them release track ‘Skank Up (Oh Lawd)’ featuring dancehall music sensation Ding Dong.